It's no surprise that I adore this feed. If you haven't seen it by now, just take a peek and I'm sure that you will love it too! 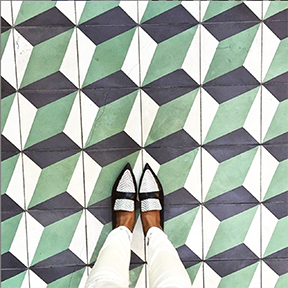 @ihavethisthingwithfloors is the most mesmerizing array of floors, tiles, carpets and ground surfaces and it's really hard to pull myself away once I start looking. Here are just a few of the 300,000+ followers already in love. Use hashtag #ihavethisthingwithfloors and add to the fun.